When my very special horse Oliver had a colic attack a year or so ago, we eased his pain straight away with the techniques that I teach in this Program. I’ve successfully dealt with many cases of colic on other peoples’ horses over my 20 odd years as an alternative therapist specializing in horses and I thought to myself with Oliver that day, that everyone should be so blessed to be able to feel calm and confident and know what to do while dealing with this potentially life threatening emergency. It’s taken me a while to pull it all together – but here it is! What I’m sharing with you in Colic Attack First Aid are the techniques – mental, emotional and physical – that I have used to achieve my own 100% success rate in successfully helping horses with colic. You’ll even get a handle on some of those mystery colics with my bonus PDF “Causes and Prevention of Colic”. These are techniques that will help you to relieve your horse’s pain and to calm yourself and your horse while you wait for the vet. In addition though and almost as big, I am deliberately bringing people to a new depth of connection with their horse, wherever you are at now. It will make you a calm, knowledgeable and effective carer to have your inner guidance system working strongly in a time of emergency. This is a full video teaching and demonstration of the Bowen muscle therapy moves designed to relieve the symptoms of colic. Bowen is an incredibly powerful and yet very simple, quick and easy to do muscle therapy that effectively relaxes muscle spasm and releases tension. The entire Colic sequence would normally take less than a couple of minutes to do, plus waiting periods. A video simulation lesson to help you learn the powerful Bowen “move” before you take it out to your horse. This makes for easy learning and I believe is one of the reasons that my distance teaching is so successful. I must be the Queen of Simulations these days – it takes so much pressure off us to be able to learn quietly, with confidence and then take that knowledge out to our horse. A video lesson on how to use an acupressure point to calm your horse and relieve pain. A breathing exercise that you can use to calm and make yourself more effective in an emergency situation. The big deal though, is that it can influence your horse to help relieve their pain too. This is an audio lesson that you can download to your mobile device and take out to your horse. An audio lesson on bringing to your conscious mind, how you personally experience feel and connection and communication with your horse. Nowhere is connection and communication with your horse more important than when they are sick. This is also a lovely lesson to download to your mobile device and take out to your horse. A video lesson about understanding your horse’s fear or anxiety in the context of a Colic Attack, and what to do about it. An audio lesson about understanding how to find your calm centre, so that with practice, you can find it even in emergency situations. 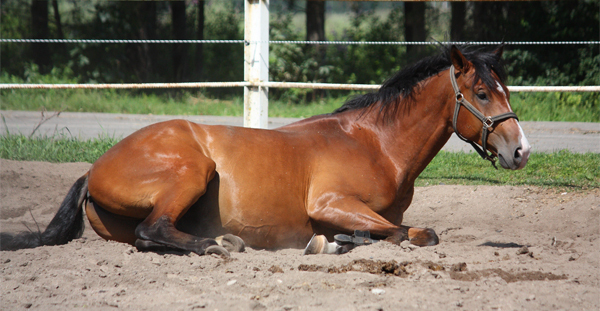 In the case of a Colic Attack, “feel” is what enables you to use your inner guidance system to help you get the best outcome – it’s a practical thing – knowing when walking feels good, when to allow them to rest, when to do some more endorphin release, when to keep them warm, when to cool them down, when to leave them alone. I’ve proved over many years now, that “feel” is utterly teachable and this lesson is a practical lesson in “feel” – it’s also one of those things that you need to practice ahead of an emergency like a Colic Attack. This audio lesson is designed to take out to your horse. When we use our own unique feel in a practical way, we can do anything – we can achieve just about anything. This audio lesson is about understanding all the different ways that we can feel for our horse, so that we can more easily recognize our own unique natural talent that we all have. There’s a video lesson dispelling the myths about using a pendulum and how it can be usefully used in circumstances like a Colic Attack. This is a written lesson with diagrams showing you the direct relationship between the spinal bones and the organs of the body – bringing most people a whole new understanding of where many of those mysterious undiagnosed Colic Attacks are really come from. If you’ve had The Six or the Nine Keys to Happiness with Your Horse, you will have seen five of these lessons before. But even if you’ve seen them, they are worth looking at again in the context of a Colic Attack. I’ve included this bonus PDF “Causes and Prevention of Colic” because preventing Colic Attacks is always our preference. And I think even experienced horse people are going to be surprised at some of the causes of colic that we should all be aware of. Feedback and Support You can have confidence in this way of learning. As part of this Program, you can send me a practice video (3 minutes or less) of the pain and muscle relieving techniques that relieve the muscle tension around the colic and I will either confirm that you are doing it right or give you feedback for improvement. Plus if you ever have a question or need more information, I personally provide full email support during your learning to ensure that you are getting the most out of your Program. Feel free to call me on +61 3 5626 7027 or email me if you need more information or have any questions. Colic Attack First Aid is priced at $75.00 AUD (a tiny fraction of a vet bill) and it comes with my usual “Love this program or get your money back” Guarantee.